Anise and Star Anise - Do You Know The Difference? WOW! Thanksgiving is over and it is less than four weeks until Christmas! I really need to get moving and finish the Christmas shopping, since half of the gifts need to be shipped to another state. Signs of the season are everywhere-at the mall, decorations on private residences, town streets and grocery stores. Archway already has its seasonal cookies out. I really love the pfeffernusse cookies with their anise flavor. I've never made them myself, but I did attempt springerle one year-disaster! Springerle are also flavored with anise, and are rolled out with a special rolling pin that has decorations engraved on it. Mine came out hard as a rock-if you hit somebody with one you'd probably kill them, or at least fracture their skull. I haven't lived that disaster down yet! Anise (Pimpinella anisum) is a plant related to the common parsley and garden carrot. It is mostly grown in the eastern region of the Mediterranean and southwest Asia. The seed pods are known as anise seed and the flavor is similar to licorice, fennel and tarragon. I never connected the flavors of anise and tarragon but on reflection I realized that there is a similarity there between the two. No wonder tarragon is a favorite herb of mine. 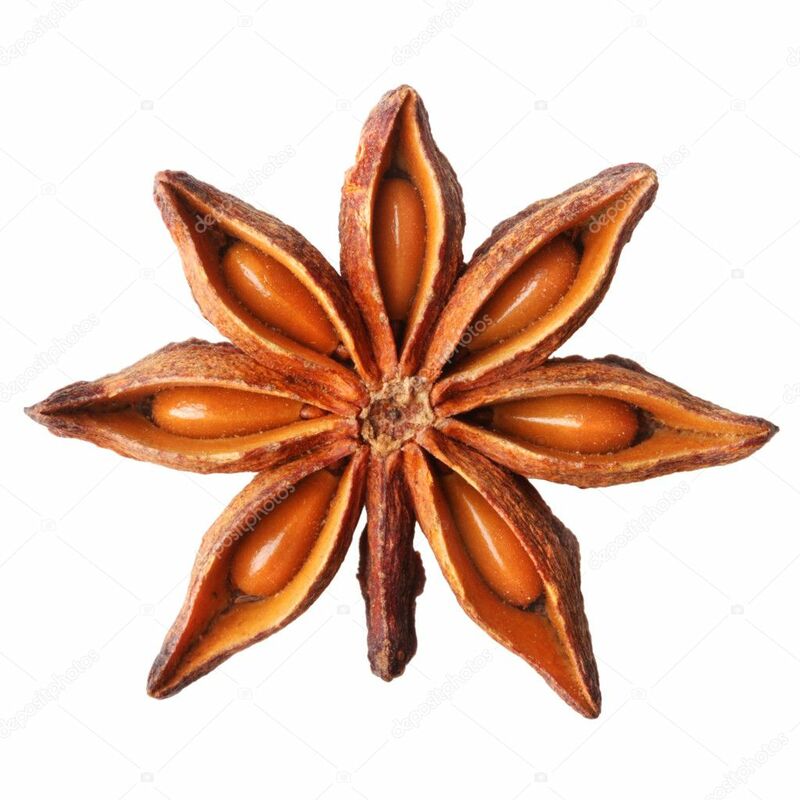 Star anise (Illicium verum) is obtained from the star-shaped fruit of a small evergreen tree native to China. This spice's flavor is similar to anise although the two spices are unrelated. Both spices contain the same ingredient, anethole, in their essential oils, which is what gives the spices their flavor. Anise and star anise are widely used in cooking, baking and liquor production, but since it is less expensive to produce star anise, this spice is gradually replacing anise in a lot of markets. Both anise and star anise are used for a variety of medicinal purposes. Each spice can be used as a digestive aid: for indigestion, nausea, prevent gas formation or help in getting rid of the gas. They are also helpful for rheumatism and coughs. Since both spices contain anethole, which is classified as a phytoestrogen (foreign substance that has estrogen-like effects), it is recommended that women who are pregnant avoid using them for aromatherapy purposes. Using a small amount of the spices for flavoring foods is not harmful to the pregnant woman. For aromatherapy uses anise and anise star can be taken in teas, in food or by chewing the seeds. They can also be mixed with carrier oils and be applied topically. Anise is useful in a variety of respiratory diseases, such as asthma, whooping cough, and bronchitis. A topical application is helpful in treating skin disorders such as oiliness, scabies and lice. Chewing the seeds help freshen breath and remedy insomnia. Because anise has an antiseptic quality it was used briefly during the Civil War for this purpose; however it was discovered to cause high levels of toxicity in the blood and was subsequently discontinued. The liquid scent is used by fishermen on lures to attract fish. During the years when steam locomotives dominated the rails, capsules of aniseed oil were placed among the metal bearings so that the railroad worker would be alerted to overheating by its strong distinctive smell. Star anise contains shikimic acid, a primary component in the anti-influenza drug Tamiflu--star anise is the industrial source for this ingredient. There was actually a temporary shortage of star anise a few years back when the demand for the drug Tamiflu was high. Reports surfaced stating that some people had severe illness after drinking star anise tea. This is thought to be due to the erroneous use of Japanese star anise (Illicium anisatum). Japanese star anise is from a similar tree, but is highly toxic. Ingesting this substance causes severe neurological effects (seizures) and also affects renal and digestive systems. Anise and star anise are two wonderful spices that can be used in your Holiday baking and cooking. Take advantage of their essential oils this cold and flu season; and if you eat too much during the festivities and develop indigestion, just get out the seeds and chew on them for relief. If you are really into baking special treats, try springerle. I haven't had the courage to try them again! After being in nursing for many years, I decided to retire from nursing and devote my time to my web business. TLC is so much a part of me, and I am working hard to help people feel better about themselves--body, mind and soul. The business I started is called KKAT VENTURES LLC and the web URL is http://www.peacefulbeing.net I am also a grandmother of three adorable children (what grandmother doesn't say this!!!). I enjoy gardening, reading,especially British murder mysteries and historical fiction, and crosswords and Sudoku. And yes, I have a cat!